BlueScope encourages employees to make a difference to their working and local environment. Throughout the Company, business clean up events are conducted to help improve the quality of the environment and work towards reducing waste. For a number of years, BlueScope Steel has been encouraging employees to participate and make a real difference to their working and local environment. BlueScope Lysaght Darwin: Volunteers from BlueScope Lysaght in Darwin joined over 1,000 others from 23 Northern Territory sites in the Clean Up Northern Australia campaign. The Lysaght volunteers collected around 50kg of rubbish from the roads near the site and generated interest from surrounding businesses who will be invited to participate next year. In total, 50.6 tonnes of rubbish was collected in the Northern Territory. BlueScope Steel Coated China: A group of BlueScope Steel Coated China employees and their families joined together for a ‘Clean Up the Environment’ Day at the popular tourist site, Lingyan Hill, near Suzhou. The group succeeded in not only making the area clean and tidy, but also influenced several tourists who pitched in as well. Port Kembla Steelworks: Over 240 employees participated in the annual PKSW business clean up day, with a record collection of 245 bags, 8 bins and 3 utility loads. Segregation of wastes collected resulted in the vast majority being recycled,. BlueScope sites often embark on tree planting activities. Trees help absorb carbon dioxide and create a fresher, healthier and cleaner environment. 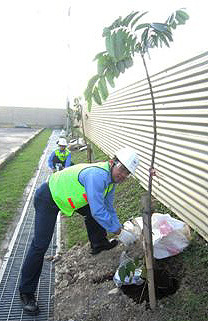 BlueScope Steel Indonesia: Representatives from each department at BSI Cilegon planted trees at nine different points around their site as part of World Environment Day 2011. 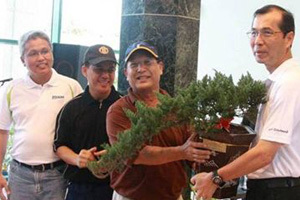 The theme for WED 2011 was “Forests: nature at your service” which helped employees understand the importance of taking action to preserve the environment. BlueScope Lysaght (Sarawak) Sdn Bhd: During 2011 employees joined in planting trees with the Sarawak State Library and Sarawak Forestry Corporation.